When playing in a major key, we have several options for resolving back to the tonic or "home" chord (e.g. Cmaj in the key of C major). A backdoor progression, sometimes referred to as a back door cadence or, when used more specifically, backdoor ii V is one of these options. The "backdoor" refers to a particular chord position in relation to the tonic or I chord. The easiest way to think of the backdoor chord is to visualise a major chord one whole step below the tonic chord root. For example, Dmaj would be the backdoor chord in E major. Gmaj would be the backdoor chord in A major. This means, if our progression was in the key of C major, Cmaj would be our tonic chord and B♭maj would be the "backdoor chord". In the key of E major, Emaj would be our tonic chord and Dmaj the backdoor. This backdoor chord can be seen in relation to the major scale as the ♭VII (flat 7th degree) chord. It's "flat" because we've taken the natural 7th degree (vii) of the major scale and flattened it by a semitone/half step. So effectively we've added an extra degree, and therefore chord, to the major scale in the flat 7th position (hence the numeral ♭VII). 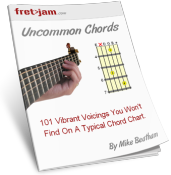 The most common function of this ♭VII chord is as a substitute for the V chord, which is commonly used before resolving to the tonic I chord. The above example is where the nickname backdoor ii V comes from, because the movement from iv to ♭VII implies a ii V relationship. There are, of course, also instances where the "backdoor chord" is not used as the pre-tonic chord (the chord before resolving to the tonic). As we're just focusing on the backdoor cadence in this lesson, we'll cover different uses of ♭VII another time. Now we know the cadential function of the ♭VII chord, we can now look at some of the different chord types that work well in this position. Tip: If you're already familiar with the V chord, any of its enhancements will also work well in the ♭VII position. The most common extension of the ♭VII triad is a dominant 7th chord, giving us ♭VII7. Naturally, then, we can extend this to a dominant 9th and 13. A lot of soul and modern R&B uses the major 7th in the ♭VII backdoor position. It carries a lot less tension than the dominant 7th variation. Note that major 7th chords won't work so well if you're using the iv ♭VII I (backdoor ii V) cadence we looked at earlier. And just like with the dominant 7th ♭VII, we can add the #11 to give the ♭VIImaj7 a little extra spice. Another soulful and relaxed use of the backdoor position is to use an "add9" chord. Just like in the V position, you can use a suspended or "sus" chord in the backdoor ♭VII position. Tip: in that second example, I resolved the suspended backdoor chord to a dominant 9th. This adds some nice voice leading to the progression. Obviously I can't cover every possible chord that can be used in this position, but experiment and let your ear be the judge of what sounds good. I hope this lesson has opened your eyes (and ears) to a "new way home" your progressions can take... through the back door!